Humans have celebrated the harvest for thousands of years. Ancient Israel enjoyed Sukkot, a seven-day festival with feasts, games, sports events and merrymaking. Church Halloween parties can provide the members with a joyous, enriching environment, even at Halloween. The church, the house of God, is a spiritual sanctuary; a place of joy, worship and refuge. Make your harvest or Halloween activity a positive, fun event; horror and haunted house-type activities seem out of place in God's house. Choose a colorful and happy theme. Autumn is a gorgeous season, so let the beauty of nature enhance your party. Create a welcoming entry to greet guests in a warm and friendly way. Set up a section of fence embellished with autumn leaves or garlands, a smiling scarecrow, lots of pumpkins and baskets to create a happy, pastoral mood. If desired, explore alternative party themes such as alien adventure, all-American, candy shop, autumn at a country fair, enchanted castle or forest, "Halloween has gone to the dogs," come into the pumpkin patch, or "The Wizard of Oz." Set up booths with easy-to-make party games featuring the event theme; serve a simple dinner and enjoy fellowship and hospitality. Provide a simple dinner such as hot dogs, chips and root beer floats, or invite the church members to bring chili for a cook-off competition. Disposable dishes make cleanup a breeze. Arrange for the congregation's chefs to make pumpkin pie cake, caramel apples or homemade doughnuts for dessert. Halloween parties invite the inner child to romp and play. Invite the church members to dress up for the occasion and have a costume parade so everyone can admire the creativity of the participants. Set up a face-painting booth and let the artistic young people's group show off their artistry. Provide lots of easy-to-put-together games such as a candy jar guessing game, bean bag throw, cake walk, mini-basketball shoot, fishing booth, pumpkin golf, donuts on a string, bobbing for apples, a penny toss, ring the lollipop, a candy-guessing game and cookie decorating. Ask the teens' and children's teachers to man the booths. Have families donate bags of candy and small toys for prizes. Rent a commercial bounce house if you really want the party to soar; be sure to have the rules posted: no swords, no shoes, no shoving. 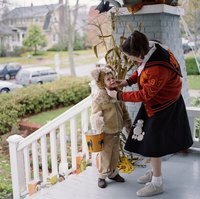 If a full-scale carnival doesn't fit your plans, explore other alternatives such as a trunk-or-treat at which church members decorate their cars in the parking lot; the children go trick-or-treating from car to car. Host a barn dance with simple decorations like pennants and pumpkins. Serve apple cider and doughnuts lots of treats. Ask a few teens entertain the young children with games, coloring pages and activities.